You’ve chosen the Glock 23 for your sidearm. As a .40 caliber gun, it has superior stopping power. Carry it with you in one of the best holsters for Glock 23. We’ve selected comfortable, secure, and quick draw holsters to speed up your shopping. Galco made this leather holster to custom fit both the Glock 19 and 23 since they are the same size and shape. It features an open top design with passive retention provided by the molding. The forward cant reflects the typical carrying angle used by the FBI. The Combat Master fits belts up to one and three-quarter inches wide. Be sure to select right or left-hand orientation. Plus, you can choose from black or tan finish. Bianchi’s Remedy holster rides high in the rear hip carry position. The premium leather is molded to fit the gun without adding extra bulk. It fits on belts up to 1 ½ inch wide. There is no strap and no adjustable retention– it’s only the molding that secures the weapon. The Fobus GL2E2 is a classic Glock holster made in Israel. Special forces and law enforcement around the world use this model. It weighs just 2 ounces but doesn’t require maintenance or break-in time. It has a rubberized paddle that lets it ride high on your belt. The protective sight channel keeps scratches off your finish. And should there be a problem in the future, it’s covered by a satisfaction guarantee and a lifetime warranty. CYA Supply Co. makes their holsters in the USA. The veteran-owned company uses a thermoplastic called Boltaron instead of Kydex. That’s because Boltaron outperforms Kydex. It’s resistant to extreme temperatures, abrasion, impacts, and chemicals. 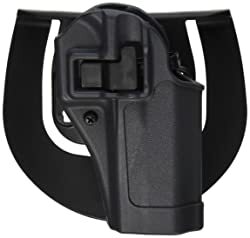 The custom-molded inside the waistband holster has cant, or carry angle, that you can alter up to 15°. It also has adjustable retention pressure. All you need in either case is the included hex Allen wrench. Once you insert your weapon, you’ll hear a click to tell you that it’s locked in place. Then, you’ll notice that the slide is completely protected by a sweat guard. Try out the holster risk-free as it comes with a no questions asked return policy plus a lifetime warranty. The BLACKHAWK! Serpa concealment holster features level II protection against holster grabs. That’s because it has a finger release button that you’ll need to press before you can draw. The position of the button is such that an attacker will find it difficult to get the right angle to take away your gun. Next, you can alter the passive retention by tightening or loosening a screw. And when you holster your sidearm, you’ll hear a click to let you know it’s secure. While you cannot alter the carrying angle, you can choose to use either the belt loop or the paddle platform. Be sure to select either right or left-hand draw configuration. The Serpa Sportster from BLACKHAWK! allows you to alter the cant, plus it has an auto-lock active retention system. In other words, it sports a finger release button similar to what you’ll find on the Serpa Concealment holster above. Plus, you can adjust the passive retention. It comes with a paddle platform only, but this means you don’t need a belt to wear the holster. The audible click means that your weapon is secure. Safariland’s ALS concealment holster has both a paddle and a belt loop. The loop is compatible with one half to one and three-quarter inch wide belts. This model has a slight forward cant plus a suede interior to protect the gun’s finish. But what’s most important is the ALS, or automatic locking system. The ALS is Safariland’s method of protecting your weapon. It has a thumb release button that won’t slow down your draw time. But it protects you against holster grabs. 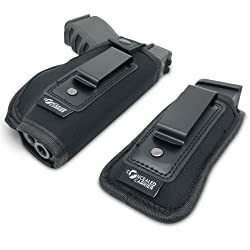 The Safariland 7378 holster is made of DuPont SafariSeven nylon that protects your weapon’s finish and stands up to extreme heat and cold without needing maintenance. Inside the holster, the raised standoffs minimize contact with your gun so that you have the smoothest fast draw possible. Choose from the soft nylon paddle platform or the adjustable belt slide if you want to adjust the carrying angle. The automatic locking system keeps the handgun secure until you release it with your thumb while you draw. Experiment with this over the waistband holster if you want to show off your handgun. Alien Gear wants you to try their Cloak Mod for 30 days. If you don’t love it, you can get a full refund. If you keep it, they offer a lifetime warranty plus free future upgrades. If you upgrade to a different handgun, they will send you a new retention shell for free. If preferred concealed carry, choose this Alien Gear holster instead. You can tuck your shirt while you’re wearing it. Also essential, you can change the ride height, the retention pressure, and the carrying angle. Since it’s an inside the waistband model, it has a neoprene backing that wicks away moisture. Plus, the holster conforms to your body so that you can forget that it’s there. It comes with the same satisfaction guarantee and lifetime warranty as other Alien Gear holsters. The Concealment Express Kydex holster perfectly fits your Glock 23. This thin lightweight material is resistant to moisture and extreme temperatures. It keeps a low profile to avoid printing on your clothes. But it only weighs 2 ½ ounces and never needs maintenance. Concealment Express offers a satisfaction guarantee and an unconditional lifetime warranty. One of the most exciting features of this holster is that it suitable for a variety of carrying positions. Wear it on your hip, palm-in back, appendix, cross draw. Change the cant up to 15° with a regular Phillips screwdriver. Then use the same tool to change the passive retention pressure. You will hear a click when you holster the gun. The beautifully crafted 1791 GUNLEATHER holster is hand-crafted from steer hide leather. It fits belts up to one and three-quarter inches wide. And the quick-draw design is available in three colors. Take note – if you have one of the latest Glock 23 Gen 5, the Fierce Defender Kydex holster should fit it. But it’s specifically made for appendix concealed carry. More importantly, it has a place for a spare clip of ammo. Both the gun holster and the ammo pouch has adjustable retention. If you want excellent security against holster grabs, try this BLACKHAWK! model. It has a thumb release pivot guard plus the Serpa auto lock release. Secure it to your thigh with quick-disconnect buckles that keep it vertical when you kneel. The rubberized straps prevent it from sliding around but stay out of your way so that you can use your pants pocket. Among leather holsters, The Defender from Relentless Tactical stands out because it fits a variety of handguns. That way you can swap your weapon every day if you like. The durable bull hide leather is hand-crafted in America and available in three colors. Outlaw Holsters makes their over the waistband Kydex holsters to fit over 200 different handguns. Of course, this includes the Glock 23. But almost none are plain and boring. You can select from the American flag, the Punisher, Don’t Tread On Me, the Texas flag, and so many more designs. 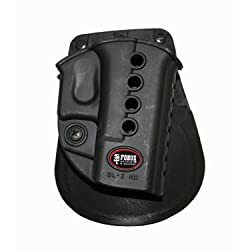 Moreover, the holsters are available with speed clips or belt loops. Or you can purchase a paddle platform. Shooters who prefer something other than stiff plastic and leather will appreciate the neoprene holster from Concealed Carrier. It has a thumb retention strap with snap and it clips onto your belt or waistband. As a bonus, they include a holster for an extra magazine. The Gold Line Shoulder Holster from Gould & Goodrich resembles a harness you’d see in a classic detective movie. It’s fully adjustable and has a back swivel to keep the straps flat. Besides space for your weapon, you can carry two clips of ammo. Skip the bulky holsters and use the ClipDraw’s Gun Clip instead. The only profile it creates is that of the gun itself. Plus, it only takes five minutes to install with the included hardware. Remove the factory slide plate and install the ClipDraw plate in its place. Tighten the screws to secure the clip, and you’re done. This inexpensive and ambidextrous solution is compatible with all Glocks in all generations. Your .40 caliber Glock 23 fits a wide variety of holsters, including many made for the Glock 19. The prices are reasonable enough that it’s possible to purchase more than one so that you can try out a variety of styles. We hope that our reviews helped you discover the best holsters for your Glock 23 today.